Vicky Phelan refused to sign a confidentiality clause in her court case and by doing so almost certainly got a lesser award than she would have, had she agreed to a gag. I admired her for that, and for her subsequent work. Now, I am reconsidering - why would she recommend the boy wonder for Taoiseach? His qualifications are that he apparently completed a journalism course but it is unclear if he was awarded a degree, he became a full time councillor at age 22 and was elected to the Dail at age 24 and has had a meteoric rise since then. Any employment prior to politics he had, would presumably be student type temporary work such as flipping burgers in McDonalds or weekend checkout boy in Tesco etc. What a CV for Taoiseach! The Boy Wonder appears in articles in the mainstream press from a very young age that predate his interest in politics. He was destined to be a star. He has just become a dad. Congratulations to him and to his wife. Would he consider becoming a full-time dad as he is smitten with his daughter and let his wife return to nursing where her services are badly needed? Phelan has just blocked a medical doctor on Twitter. Is it too much to suggest she was a shill set up from the start to soften the impact of the scandal? She's also been shilling for more investment in clinical trials and a new drug called Pembro. Harris' lack of qualifications is secondary to the larger point - he has the headspace of a serial killer. And given the prevalence of dodgy health minister MD's - Reilly and Varadkar to name but two - I'd sooner have a layperson of good heart and who has a practical grounding than these ideologue "experts" that is now mass manufactured by academia. Not that there is anyone sane within reasonable proximity of this serial killer regime that would be suitable. The overlords have decided that Varadkar's usefulness has burned out to be replaced with Coveney or Harris, cut from the same cloth as Bush/Blair/Rumsfeld/Sutherland. When Harris or Coveney become Taoiseach, as they will in a concocted coup before the end of the year, we're in Snake Plissken territory folks. just keep replacing the puppets in the t-shock's office and give the plebs the illusion of progress. the bilderberg consortium must be happy. He is now proposing legislation to "presume consent" to our organs being removed, "brain death" being a clinical lie. 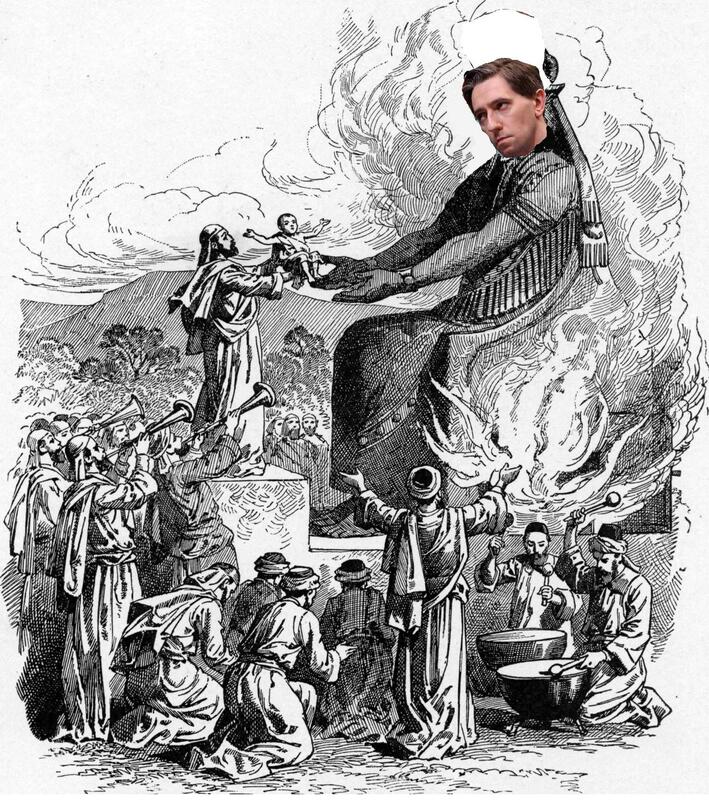 Simon “Herod “ Harris is one of these truly evil politicians that appear on the island every few centuries to leave a legacy of slaughter and destruction everywhere they go. Sad to note Vicky Phelan promoting Simon Harris for Taoiseach whilst at same time saying "that" about "men".